Puan Hjh. Jamilah bt Hj. The role of Digital Team is to assist with digital media content, print & publications, multimedia and broadcast, and language translation. To facilitate coordination with all publications in the Archdiocese. 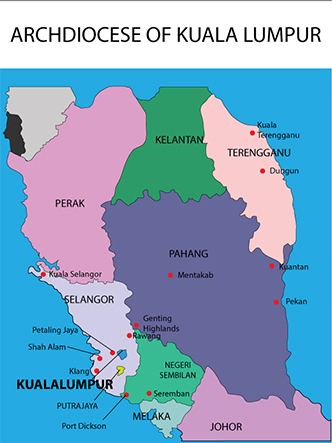 The Catholic Asian News (CANews) is a monthly publication of the Catholic Bishops’ Conference of Peninsula Malaysia. It began publication in 1979 with the aim of raising awareness of theology, spirituality and the teachings of the Catholic Church by presenting well-informed discussions of topics relevant to the Catholic community. It also strives to draw Catholics into a deeper appreciation of their faith by assigning themes to each month’s publication which promote deeper reflection on God’s word as well as on the universal teachings of the Church, thus helping form a more mature, better educated Catholic individual. The Catholic Research Centre (CRC) is an integrated centre for research, reflection, information and formation for the Catholic Church in Malaysia. Founded in 1977 with the objective of helping to build up the Malaysian Catholic Church, it later consolidated its position to focus on bringing about societal awareness to the laity regarding their role in the country’s socio-politico, economic and religious rhetoric. The Centre seeks to address complex societal issues through the lens of the teaching of the Catholic Church and the Magisterium, in a context which is understandable and accessible to all lay people. In doing so, the Centre facilitates the process of discernment of every Malaysian Catholic who wishes deeper insight and understanding into issues affecting society, and the role of Catholics within that societal fabric. It assists parishes and pastoral districts in the training of BEC and Community Leaders, using a Christ-centered and Word centred methodology towards a New Way of Being Church. The Archdiocesan Pastoral Institute (API) is the formation and animation organ of the Archdiocese of Kuala Lumpur. The primary objective of the institute is to provide relevant formation and information to the People of God to enable them to deepen their faith and to live as authentic Disciples of Christ. Its long-term goal is the realization of the vision of “A New Way of Being Church” through the transformation of local parishes into A Communion of Communities (BEC). 85A, Jalan Yam Tuan, 70000 Seremban, N.S. The AMEIA seeks to create an awareness among Catholics of the importance and means of ecumenical and inter-religious dialogue. We are also the official arm of the Archdiocese responsible for building bridges and promoting dialogue with other religious traditions, churches and ecclesial communities. The team helps promote and organise the Catechesis of the Good Shepherd programme, most especially for pre-school learners (3-6 years) on the invitation of parishes. The team, made up of young adults, help facilitate Theology of the Body sessions for teenagers (13-17 years) on the invitation of parishes. The Archdiocesan Pastroal Council (APC) is a consultative body prescribed by Canon Law and under the authority of the Bishop to study and weight matters which concern pastoral works in the Diocese and to propose practical conclusions Canon 511. 71000 Port Dickson, N. S.
Mass will be celebrated once a month, 2nd Sunday of the month (with flexibilities during holidays) at 11.00am at the Chapel of Kristus Aman, TTDI, Kuala Lumpur. Tuesday 8:00 pm : 43FL, Function Room in Mont’ Kiara Bayu Condo.